I've mentioned before that I'm not the biggest muffin fan. I think it has to do with the processed tasting muffins I grew up with. Super sweet...no discernible texture...ginormous. I don't remember my mom ever making muffins at home except for the type you can buy in a box that has a little can of blueberries right in the box itself. And okay, I actually did like those. But other than that, it was (different) muffins from a box or a coffee shop and I never really liked them. Fortunately, I have discovered a few different types of muffins that I actually like A LOT in the past six months or so and I will be keeping them in my arsenal...ready to mix up for guests or easy breakfasts or just because. 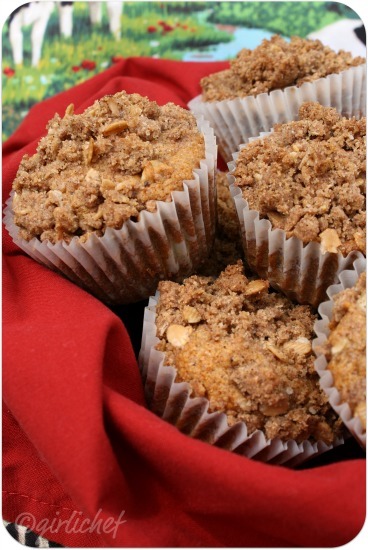 It really all began with those Sweet Potato Muffins w/ Bacon Pecan Streusel. The flavor! And coming in as another "keeper" were the Brown Butter Blueberry Muffins (way better than the boxed mix I remember, by the way). Now, I never...ever...would have thought that a vegan muffin would fall comfortably into my top 3. But, low and behold, it did. 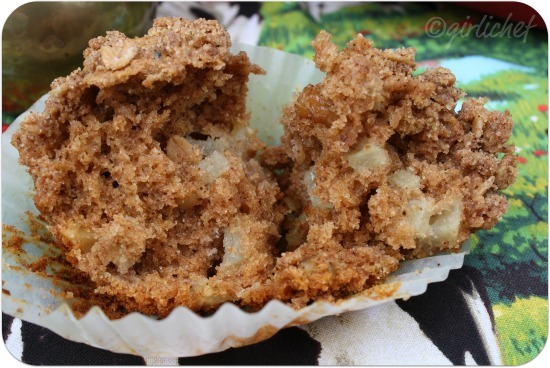 I consider these muffins pretty darn healthy, but they don't taste like health food. They don't have that cloying sweetness that makes me loathe muffins. They are made with spelt flour and rolled spelt. They have bits of fresh apple and roasted nuts in every bite. And they smell like home. I changed them up a bit from the original recipe that called for a mixture of white and whole spelt flour since I only had whole. I switched out the rolled oats for rolled spelt. I switched out the soy milk for almond milk. All this because it's what I had on hand...and though I've never tried them made as originally written, I'm not sorry...because they were amazing. Preheat oven to 350° F. Line muffin tins with liners (or oil them). crumb topping: Combine all dry ingredients in a small bowl. Add oil and almond milk and rub together with your fingers until you have crumbs the size of peas or small pebbles. Set aside. 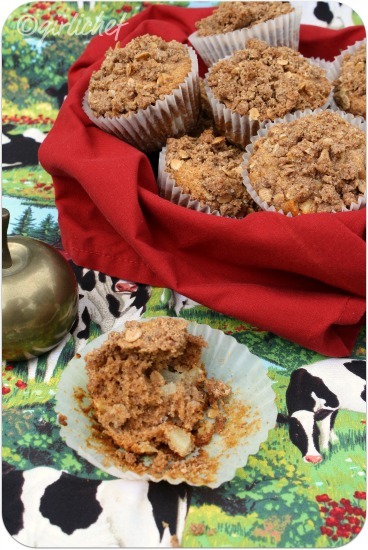 muffins: Toss apples with cornstarch and set aside. In a large bowl, whisk together coconut oil, maple syrup, and almond milk. Sift everything else (except the walnuts) into the bowl and stir until just combine. Gently fold in the apples and walnuts. Divide batter amongst muffin tins. Divide crumb topping over each. Slide into the oven and bake for 20-30 minutes, or until a toothpick comes out clean. I like these muffins best when they have cooled down a bit...but still have a bit of warmth. Seductively spiced and studded with bits of apple and walnut, the whole family finds them hard to resist. They are a fabulous breakfast or snack option and would be the perfect "welcome to the neighborhood" gift, too. Wholesome Wholegrain Cooking: Spelt/Oats in Breakfast hosted by ME this month! 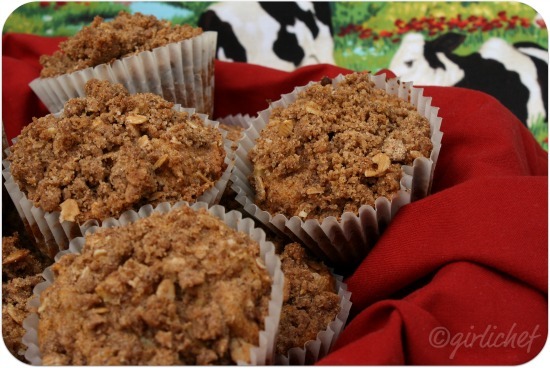 Muffalicious, these look great and I'm still trying to get something together for your oats party! Que delicia, esto tiene que estar divino. So moist and that topping! Yum! I am a big muffin fan and these look totally scrumptious. Looks perfectly moist and flavorful! I'm glad to see you tried another recipe from Paltrow's book. I'm pretty sure the copious amount of maple syrup in these muffins would win me over. Maple has got to be one of the best flavors in the world. P.S. We watched Just Go With It with Adam Sandler last night and I didn't know that Dave Matthews was in it. Have you seen it yet? If not, it's one to rent for sure! They have come out soooooooooo well and tempting dear. Not gonna lie, I'm not really a muffin girl either. I think I just love frosting too much and once you add frosting, it's really just a cupcake. I do love that streusel topping though! Totally worth foregoing frosting for! I can easily have more muffins, simply irresistible..
Wow.. my kind of sweet treat for breakfast!! Do you know thw muffin man, the muffin man ...I for one am a fan. Still don't have that book but, will try these when I do. I just got my hands on a copy of this book and after your successful muffin post I'm excited to jump in and start my review! What can I use instead of the spelt flour? Like whole wheat flour? I'm totally itching for fall! !